In the 20th century, the question of causes dominated discussions about revolution among historians and political scientists. 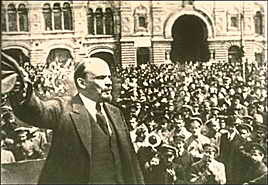 What caused the Russian Revolution? Whose theory of revolutionary ignition made more sense? Are there discernable warning signs that a revolution like the one that occurred in Iran is about to happen in Iraq? Causation may have been the 20th century's concern, but before then, etiology—the predictable course that revolutions take, once they begin, was the more common topic. Many ancient philosophers, such as Socrates, believed in a cycle of revolutions, including monarchic, aristocratic, oligarchic, and democratic phases. Edmund Burke objected to the French Revolution because, he argued, once revolutionaries threw aside prior laws and traditions, nothing restrained the most violent, unscrupulous leaders from rising to the highest reaches of power. Marx and Engels focused more on explaining where the revolutions that drove societies from one "mode of production" to another (for example, from feudalism to capitalism) than they did describing "the revolutionary moment." All of these thinkers, however much they disagreed on other issues, had a common and somewhat pessimistic view of how much individuals could steer the course of a revolution once it began. In Book V of The Politics, Aristotle describes how states with different "constitutions" (in his terminology, the type of regime, such as an oligarchy) have defects that, if unchecked, inspire particular kinds of revolutionary forces. Oligarchs, for example, can't help but oppress the larger population, which can create the mass outrage that explodes into popular revolution. Members of the same oligarchic faction develop rivalries and resentments that can lead to coups and civil wars. Some oligarchs are smart enough manage these risks, tempering these rivalries and avoiding excessively oppressive measures. Smart oligarchs may stay in power longer than others, but that's not the same as saying they can achieve total mastery of their destinies. Heraclea, Cnidos, Erythrae—Aristotle names several oligarchies that failed, despite the best efforts of the oligarchs. There's an old, old question peeking around the edges of this discussion of revolutionary etiology: What decides the outcome of major events, the leaders involved or impersonal historical forces beyond their control? This question arises in many different contexts, from Tolstoy's War and Peace to John Ellis' Brute Force, an argument for the "inevitability" of Allied victory in World War II. You don't have to find a final answer to this question to see that revolutions take natural courses, passing through similar, predictable phases. Whether human beings can slow down or stop this revolutionary progression is a separate issue than whether events tend along a familiar trajectory. Although 20th century thinkers spent more time on causation than etiology, a few students of revolution did take a stab at describing what these predictable phases might be. You might not have heard their names before—perhaps, in part, because the course of evolution is such a sketchily-addressed topic. The two I'll mention here, Crane Brinton and Lyford Edwards, have very similar theories of revolutionary etiology, so it's fair to discuss their two books on the subject together. A period of unrest and uncertainty preceding the revolutionary outbreak. A catalytic event that starts the revolutionary motor. The collapse of the old order, followed by a period in which moderate factions hold the reins of power. The failure of the moderates, followed by the radicals' seizure of power. The exhaustion of the terror campaign. A period of "cooling down," during which the radicals may or may not lose power. The return to normal politics, signaling the end of the revolution. If you think revolutions follow a predictable path, you're left with an obvious question: is Iraq fated to follow the same course? Are the number of troops the United States and its allies deploy, the amount of aid sent to the Iraqi government, and the recent elections all irrelevant to what will happen there, regardless of our efforts? I don't find the argument about historical inevitability convincing. Revolutions often fail, as did the Sandinistas' revolutionary regime. Leaders can unleash long, bloody reigns of terror, such as the terror famines and the great purges under Stalin, or they can be relatively short and less violent, such as the Iranian mullah's consolidation of power. Certainly the repressive measures that the Revolutionary Guards and other instruments of that consolidation were brutal and destructive, but they never reached Stalinesque proportions. History with a capital "H" may propel societies through these revolutionary phases, but how quickly, and what happens during them, is something that human beings can affect. Iraq may be passing though exactly the phases that Brinton and Edwards describe. If we're trying to support a moderate regime, it may be at enormous risk, for all the reasons moderates have failed in other revolutions. The radicals are usually better organized and motivated than the moderates. As long as the moderates are in power, they bear the blame for whatever failures or mistakes the new government commits. Many people frustrated with these setbacks join the radical faction, with either enthusiasm or resignation. In short, the short-lived seizure of power in Fallujah by the Army of the Mahdi, one of many radical factions in Iraq today, may have been a harbinger of things to come in the rest of Iraq. So, too, was the disgust of many living in Fallujah with their "liberation" by the radicals, and the repression that quickly followed. Unfortunately, the residents of Fallujah were furious with the American "liberation" as well. How we fight this war in Iraq does matter—we and the Iraqis are not merely leaves blowing in a revolutionary gale. We can see where events may lead, and respond accordingly. Sometimes, we may be able to cut short one of the phases of revolutionary cataclysm; at other times, we may have to merely ride them out. The Iraqi elections run along a revolutionary knife's edge. If, as the Bush Administration argues, elections will build an intimate connection between the voter and the government, that bond may just as easily make matters worse as better. If Iraq is passing through the stage of moderate rule, the elections may become the symbol of what the "new Iraq" is supposed to be. In other words, the elections may frame what the current "regime of moderates" is supposed to be: broadly representative of all Iraqis, regardless of religious outlook, ethnic background, clan affiliation, political ideology, or any other identifying characteristics. If the elected government doesn't seem representative, or fails to deliver equal justice, reconstruction, and security to all groups in Iraq, the moderates in power may find themselves facing more outrage and frustration than if the elections had never occurred. The elections, therefore, may undermine the moderates at this critical phase in the transformation of Iraq, not help them. Few can blame a provisional government for not being completely representative of a fractured, fractious country. Everyone can blame a new set of leaders in Baghdad and their American patrons if elections fail to produce a more representative, responsive regime than the interim government. POSTSCRIPT: The term etiology was my doctoral advisor's favored way of phrasing this issue. I also have Harry Eckstein to thank for showing me how important—and, unfortunately, neglected—revolutionary etiology has been. there as much as you like. I always thought that the revolutions, the touches of state or similar to it has to do with the uncertainty of government and lack of security, so no excuse for war and death that this has caused! In the third, I think that Wesley Clark’s recent analysis of how America defeated the Soviet Union is on the mark, basketball shoes shop and that we will have to continue to push the contradictions on the various parties that are still entranced by the Marxist fallacies. shop nike shoes This requires engagement with Russia and the former Warsaw pact nations to keep Russia on track and to try to minimize backsliding in parts of the old SU. air jordan retro sneakers We need to work China off against North Korea, newest air jordans and we will at some point need to deal with Castro and his few remaining Western friends. In other words, the elections may frame what the current "regime of moderates" is supposed to be: broadly representative of all Iraqis, regardless of religious outlook, ethnic background, clan affiliation, political ideology, or any other identifying characteristics.